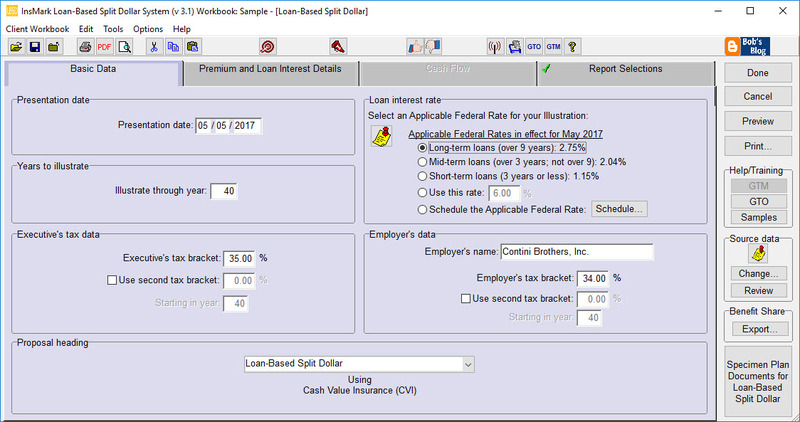 There are two variations of loan-based split dollar, and both are available as illustration modules in the InsMark Loan-Based Split Dollar System. One variation is cast between employers and valued executives (referred to as the Loan-Based Split Dollar) and the other is cast between private parties (referred to as Loan-Based Private Split Dollar Plan). Both variations provide a new way to generate life insurance benefits and equity transfers and both are in compliance with the Final Split Dollar Regulations. Complies with the Final Split Dollar Regulations issued in September 2003. Illustration data is obtained through an electronic link to insurance company’s illustration systems via InsMark’s proprietary Button File technology. Illustrates new equity-type plans as well as the conversion of in-force equity split dollar plans (including the conversion of prior Employer split dollar advances to loans). 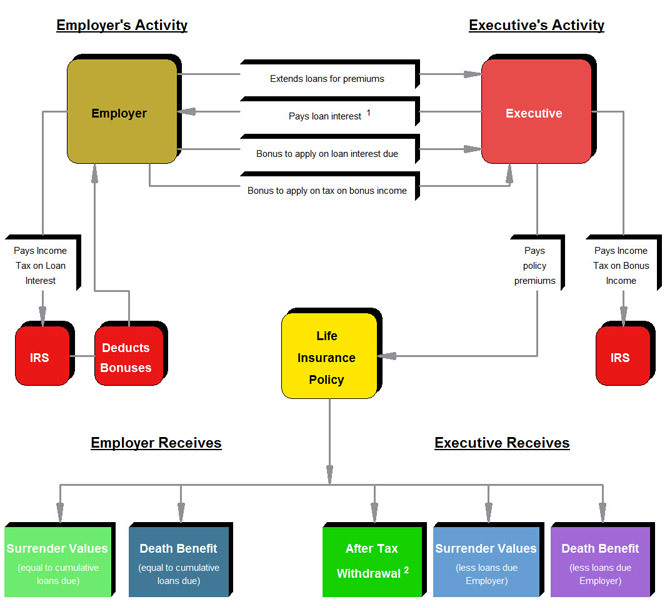 Illustrates loans from Employer to covered Executive for policy premiums. Illustrates long-term loans (more than 9 years). Note: Upon specific approval from the licensed insurance company, LB-SD can be configured to illustrate demand loans. Will not produce an illustration dated in any month in which the user has not first visited InsMark’s website to download the Applicable Federal Rates in effect for that month. Illustrates loan interest at least at the Applicable Federal Rate established under IRC Sections 7872 and 1274(d). Note: Use of interest-bearing loans (as opposed to interest-free loans) eliminates any impact from the Original Issue Discount (“OID”) rules of IRC Sections 1271-1275. When applicable, these rules require the Executive to include in income the difference between the face amount of each loan from the Employer and the present value of that loan discounted at the Applicable Federal Rate. Frequently, this can result in taxable income equal to 60% to 70% of each loan. Can illustrate a single loan to the Executive placed in a Premium Reserve Account to be used to “feed” a policy with sufficient annual premiums to avoid MEC classification. This allows a favorable long-term Applicable Federal Rate to be locked down for the term of the loan. Note: The Premium Reserve Account can be illustrated as a taxable or tax exempt account or a period-certain single premium immediate annuity -- with the latter generating an additional sale. 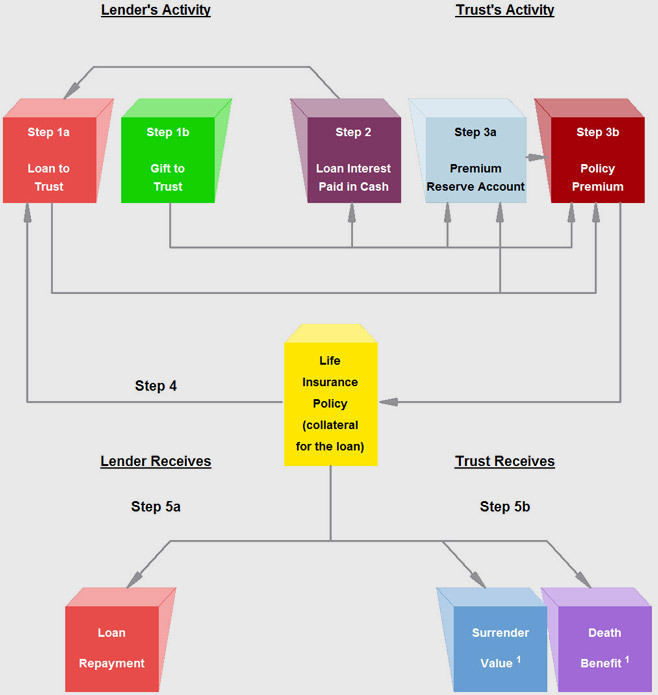 Can illustrate a single loan to the trust placed in a Premium Reserve Account to be used to “feed” a policy with sufficient annual premiums to avoid MEC classification. This allows a long-term Applicable Federal Rate to be locked down for the term of the loan. Illustrations are accompanied by a multi-page Preface that is illustration-specific in its details. Presents numerical data in Summary and Lender/Trust-specific formats. Special numerical columns in the LB-PSD reports can be included that illustrate additional policy loans funding loan interest payments or loan repayments. Contains InsMark’s unique InsScribe® System which automatically generates illustration-specific Flow Charts and Graphs. Summarizes the effect on the parent’s overall gifting limits. Includes a comprehensive PowerPoint show useful for producer and adviser education. Includes a comprehensive electronic Guide to Marketing. Note: A high-end sister product to the InsMark Loan-Based Split Dollar System is the separately licensed InsMark Loan-Based Deferred Compensation System (cast between Employers and Executives) using loan-based split dollar principles in which the covered Executive uses a compensation adjustment to provide the Employer with all (or part of) the funds that the Employer loans to the Executive. The results are dramatic in that ordinary pre-retirement employment income is traded for tax free retirement income through policy loans. In addition, a severance arrangement is included in the illustrations showing a repayment of the compensation adjustment taken by the Executive in the event of termination of employment, retirement, or death. Specimen severance agreements are included as part of plan documentation including a version for executives of tax exempt organizations designed to comply with provisions of IRC Sec. 457(f) regarding constructive receipt. Other than this additional capacity, the illustration, documentation, and marketing support aspects of Loan-Based Deferred Compensation are similar to Loan-Based Split Dollar. Obtains its data through an electronic link to insurance company’s illustration systems via InsMark’s exclusive Button File. Illustrates loans for policy premiums from parent (typically) to an “intentionally defective” irrevocable life insurance trust. Gifts to the trust are scheduled to offset any loan interest due by the trust. Note: The lender is assumed to be the grantor of the trust and, due to grantor trust rules, there is no income tax due by the lender on such loan interest received, i.e., the Lender and the trust are a single income tax entity. (IRC Section 671 and 675, IRS Reg. 1.671-2(c) and Rev. Rul. 85-13.) Thus, if gifts for loan interest are made, they are returned at once as non-taxable loan interest. Can illustrate accrued loan interest. This is particularly valuable if gifts needed for loan interest exceed the amount of available annual gift exclusions and/or lifetime gift exemptions. Note: As discussed in the report, upon specific approval from the licensed insurance company, the illustration module can be configured to interest bearing demand loans. Note: Use of interest-bearing loans (as opposed to interest-free loans) eliminates any impact from the Original Issue Discount (“OID”) rules of IRC Sections 1271-1275. When applicable, these rules produce a gift of future interest to the trust of the difference between the face amount of each loan and the present value of that loan discounted at the Applicable Federal Rate. Frequently, this can result in loss of a portion of the lifetime gift exemption equal to 60% to 70% of each loan. In large cases, it can trigger gift taxes. Note: The policy involved in estate planning transactions between parents and a trust is typically a survivor life policy. One serious shortfall of a survivor life policy subject to a split dollar arrangement is soaring economic benefit rates at advanced ages -- particularly after one of the insureds dies. The Applicable Federal Rate is unaffected by this condition. Can illustrate bonuses from Employer to Executive to provide funds for loan interest using a single bonus, gross-up bonus, or design-your-own bonus. LB-SD alternatively can illustrate some (or all) loan interest due the Employer paid by policy loan. LB-SD can also illustrate repayment of the Employer’s loans from policy loans. The user can designate any combination of these features. Note: Even if offset by a bonus, so long as loan interest due to the Employer is actually paid by the Executive (not deemed paid as is the case with a below-market loan), deemed dividend distributions are avoided for a participating Shareholder-Executive. Presents numerical data in Summary and Employer/Executive-specific formats. Special numerical columns in the reports can be included that illustrate policy loans funding retirement income for the Executive. Illustrates Employer’s year-by-year cumulative Charge to Earnings. Includes significant specimen documents including promissory notes and collateral assignments both of which contain reassignment provisions should the Employer wish to obtain loans from another source (e.g., a bank) to fund the plan. Blocks the illustration of a modified endowment contract as a MEC securing a loan produces taxable income to the policy owner to the extent of any gain in the policy (realized or unrealized).